Accused entering a police van. The Fourth Prosecution Witness (PW4) in the Ya Na Trial, Alhassan Yakubu aka Nat yesterday dropped a bombshell when he told a packed Fast Track High Court in Accra that it was Yidana Sugri (the man who was acquitted and discharged for killing the Ya Na) who held the severed hand of the Dagbon overlord and said he did not see any of the 15 accused persons currently on trial killing the Ya Na. He insisted yesterday under cross-examination by counsel for the 15 accused Phillip Addison, that when he testified in the trial of Sugri and Iddrisu Janfo in 2003 he had told the court then presided over by Justice Yaw Apau currently with the Court of Appeal that it was Sugri who held the Ya Na’s severed hand but did not say he(Sugri) killed him neither did he see anybody use dormer machine to cut the head and hand of the Ya Na. Counsel: Do you know Yidana Sugri and Iddrisu Janfo? Counsel: Do you know they were charged, acquitted and discharged for killing the Ya Na? Counsel: The allegation during the trial was that Yidana Sugri was the one who killed the Ya Na? Counsel: In this trial they say somebody else decapitated the Ya Na? Witness: He (Sugri) was holding the severed hand of the Ya Na. Witness: I said he was holding the severed hand of the Ya Na. I did not say he killed the Ya Na. Counsel: You are not telling this court the truth? Witness: What I am saying is what I said at the Wuaku Commission and they (Commission) wrote it in their own way. Counsel: At the time you testified at both Wuaku and the Sugri trial, you did not say you saw the Ya Na being decapitated by anybody but you are trying to say so in this trial? Witness: I did not see it. I heard the sound of a machine used in cutting woods. I did not see the person who was operating the machine. Alhassan Yakubu, the PW4 who was led in evidence by Rexford Wiredu, Principal State Attorney was testifying in the case in which the 15 men including the former District Chief Executive of Yendi have been charged for killing the Ya Na and some of his elders during the intra ethnic chieftaincy conflict in Dagbon between Abudus and Andanis in March 2002. 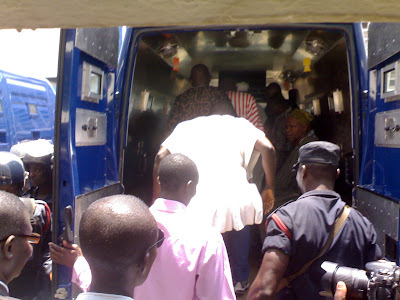 The accused are Iddrisu Iddi aka Mbadugu, Alhaji Baba Abdulai Iddrisu aka Zohe, Kwame Alhassan aka Achiri, Mohamadu Abdulai aka Samasama, Sayibu Mohammed, Alhassan Braimah and Alhaji Mohammed Habib Tijani, 45, former DCE as 2nd, 3rd, 4th, 5th, 6th and 8th accused persons respectively. He said in his evidence-in-chief that he had gone to visit a friend called Abdul Aziz at Yendi Secondary School on March 25, 2002 when he heard gunshots and later saw people running from the town and was later told that the Abudus were attacking the Gbewaa Palace and being an Andani he feared for his life and spent the night hiding in the school. But pointed to him that when he testified at the Wuaku Commission he had said at the school it was one of the masters who had advised the students including the witness to stay there because there was conflict in the Yendi town but PW4 insisted “Wuako Commission wrote what they wanted to write”. He admitted that when he entered the palace on 26th March 2002 and the place came under gunfire attack from the Abudus the inmates of the palace who he said were not many were able to fired back to repel the attackers and shot at them until they (Abudus) started burning down the palace and they run to hide at the Katine (where they burry the Ya Nas) but later move to lie at a place where there were packed fire woods. He claimed that whilst there he saw two of the accused persons dragging the Ya Na who also resisted them contradicting Imrana Saibu’s (PW3) evidence that he lied about 30 meters and saw two of the accused dragging the lifeless body of the Ya Na. He also told the court that they were six including Saibu PW3 lying by the firewood contrary to the evidence of Saibu that he lied there alone and saw some of the accused persons using dormer machine to cut off the head and hand of the Ya Na. Concluding his cross-examination Saibu (PW3) insisted that the Ya Na son asked him to bring the satellite dish to Yendi after it had been sent to Tamale from Wa but at Wuaku Commission he had said he was asked by a friend to come to Yendi to cart the dish away because the place was volatile and anything could happen to the dish. Furthermore at Wuaku Commission the witness testified that whilst six of them lied down beside the firewood he could not get up to see what was happening because he had been shot was in pain and that it was one Amadu who would occasionally get up and watch and tell him what was happening contrary to his evidence in the current trial that he was alone and saw how some of the accused persons had cut the Ya Na’s head and hand with a machine and set fire to the body with and some taking photographs with the severed head in turns. At Wuaku Commission the witness had testified that he could not identify the prison officer he met after escaping from the palace because he was in pains and said it was one Thomas who could identify him (prison officer) but in this trial he said he could identify him. Interestingly, anytime the witnesses were confronted with their testimony at the Wuako Commission they said one thing: “the commission wrote it the way they liked and even disputed some of the statements they gave to the police this year in connection with the trial. Sitting continues today for PW4 to face further cross-examination.